Like our Facebook page and see what we’re up to! We are opening up another trip for any young people who have missed out on the chance to take part in our other trips coming up this week. We are going to see the new Dumbo movie 🎥 🍿 at Vue cinema, Ocean Terminal. We have 10 spaces available (first come first served for those who are not already booked on a trip). Hi all, this weeks Easter Programme is now fully booked! However we still have space at our drop-in swim hub this Tuesday evening from 7:30pm - 8:30pm at Craigroyston Community High School for S1-S6 year groups. If you haven’t been to our swim hub before please make sure you pop into the MYDG office for a consent form before hand. We are back outside tonight at Muirhouse Park next to the basketball arena, there will be lots of fun sports and games. 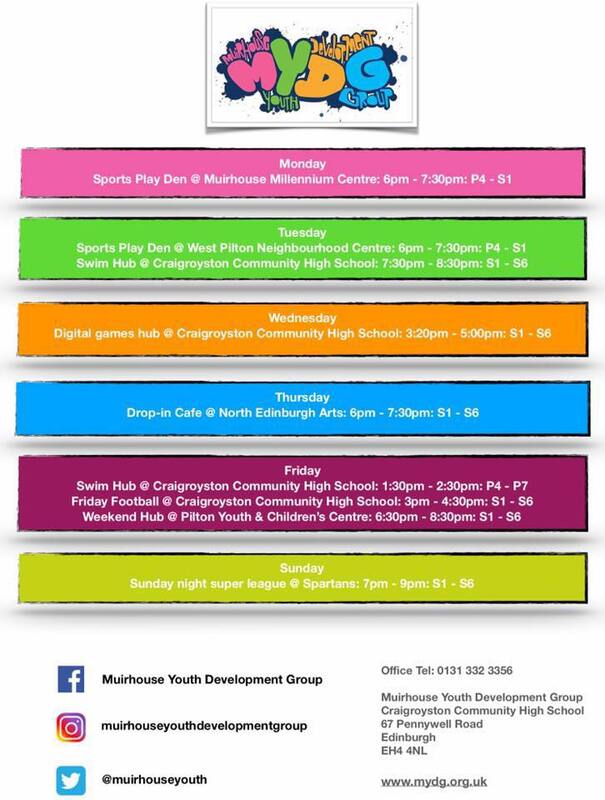 Muirhouse Youth Development Group is at Craigroyston Community High School.